National Comedy Center Opens in Jamestown New York. Erie Times News, July 18, 2017 In an 8 – 0 vote with one absence, the board accepted the $435,000 bid of Erie-based E.E. Austin & Son, Inc. To view article, click here. In an 8 – 0 vote with one absence, the board accepted the $435,000 bid of Erie-based E.E. Austin & Son, Inc. To view article, click here. Cutting Edge, Erie Regional Chamber and Growth Partnership, June 29, 2017 “The newly constructed amphitheater is absolutely gorgeous, tip of the hat to E. E. Austin!” To view article, click here. Erie Times News, June 28, 2017 The sun’s rays glistened on Presque Isle Bay’s choppy waters early Tuesday evening as concert goers parked lawn chairs at Liberty Park… To view article, click here. Erie Times News, May 11, 2017 Construction of the new permanent roof at the Highmark Amphitheater at Liberty Park will be finished before the end of May, according to Chuck Jenkins, vice president of Erie’s E.E. Austin & Son, Inc. To view article, click here. The Post-Journal, April 15, 2017 Tom Benson is so close to the fundraising goal for the National Comedy Center that he doesn’t want to jinx the final push for funding for the $25 million project. To view article, click here. Erie Times News, April 14, 2017 Work crews from Erie’s E. E. Austin & Son, Inc., 1919 Reed Street, started installing the roof’s wooden skeleton this week. To view article, click here. Erie Times News, April 7, 2017 The new permanent roof at Highmark Amphitheater at Liberty Park is about to take shape. To view article, click here. Erie Times News, April 5, 2017 General Contractor, E. E. Austin The Sarah Reed Senior Living expansion in Erie is tentatively scheduled to open in June. To view article, click here. 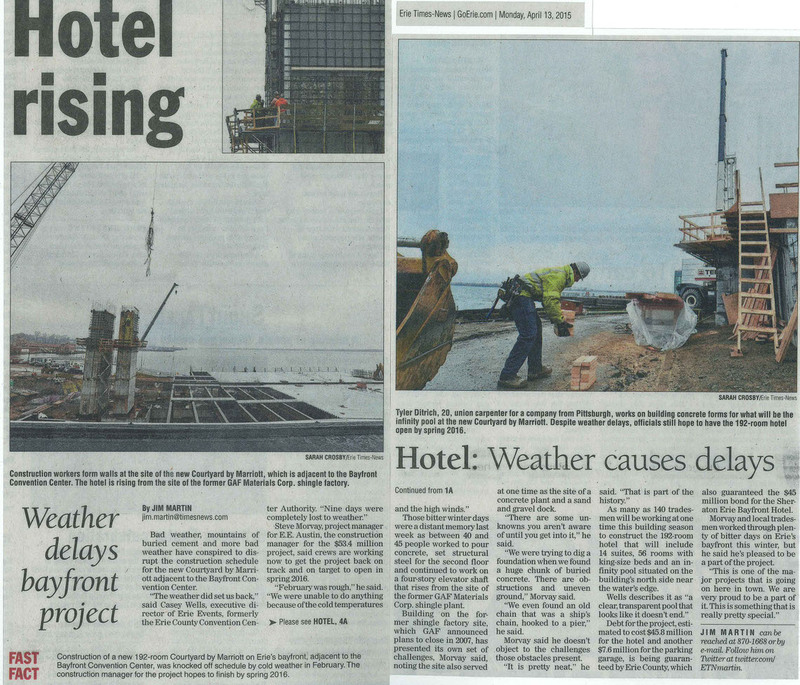 Erie Times News, February 14, 2016 CONSTRUCTION: Company has played a key role in region's big projects. Photos of some of the area's most iconic structures line the walls at E.E. Austin & Son, Inc. Some are nearly 100 years old, like the 1924 photo of workers using horse-drawn carts to build Veterans Stadium. To view article, click here. Erie Times News, January 24, 2016 The Erie-based construction firm of E.E.Austin is thought to be the first company to complete the Occupational Safety and Health Administration (OSHA) Callenge Program. To view article, click here. 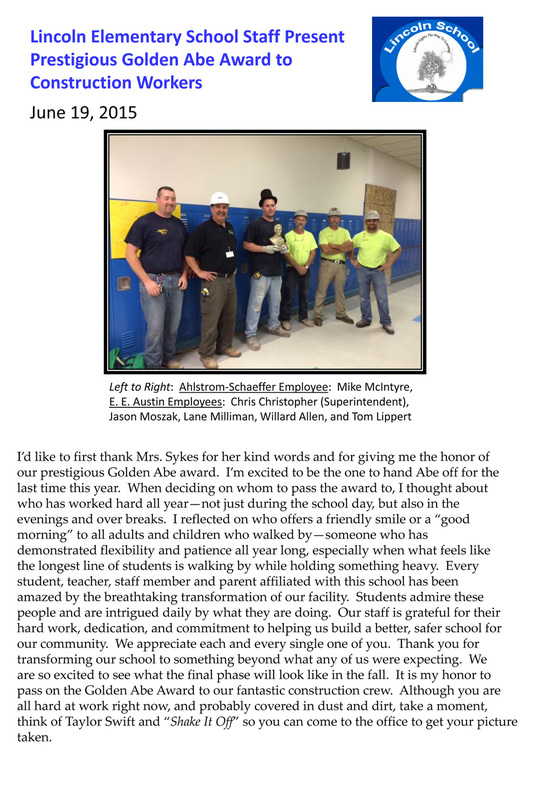 June 19, 2015 E. E. Austin & Son's crew at Lincoln Elementary School in Jamestown, New York, earned the Golden Abe Award for "their hard work, dedication, and commitment to helping us build a better, safer school for our community." To view article, click here... To view article, click here. 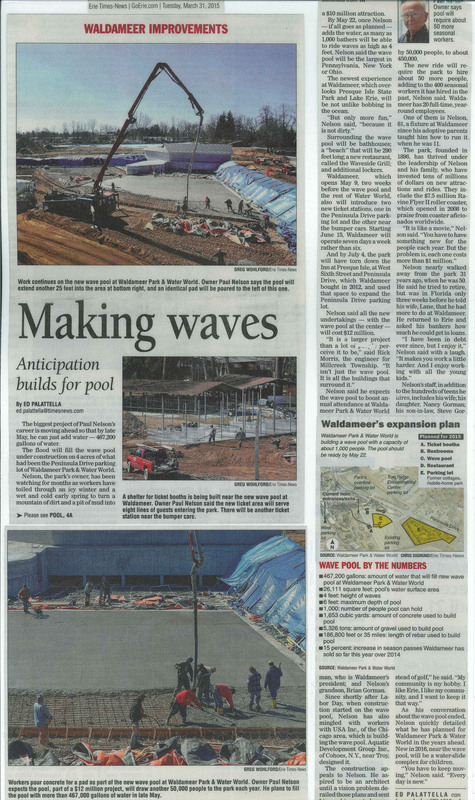 Erie Times News, March 31, 2015 Austin ServAll Concrete furnished over 2000 cubic yards of concrete for Waldameer's new wave pool. To view Article, click here. E.E. Austin & Son, founded in 1906, were General Contractors for the construction of the Erie Veterans Memorial Stadium built in 1924. To view article, click here. Erie Times News, August 4, 2013 “Our Finalists ~ Commitment to Erie" The finalists for the 2013 Commitment to Erie Awards range from one of the largest employers to an upstart restoration business. The list also included some of the most noted entrepreneurs and four active nonprofit organizations. To view article, click here. 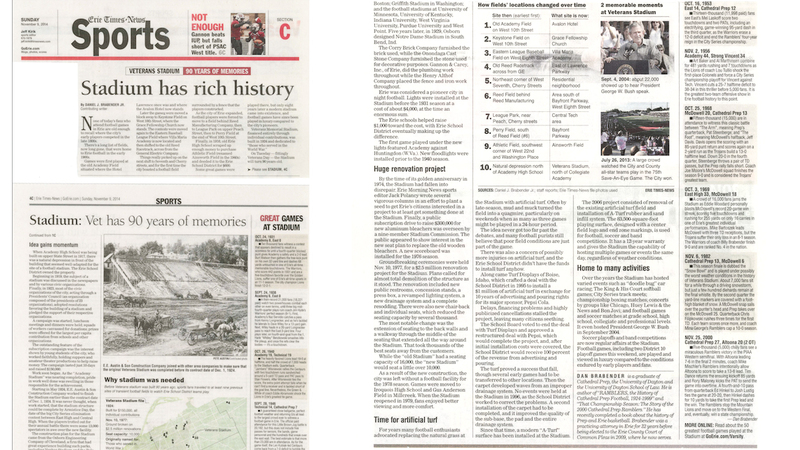 Buffalo Business First, May 2013 "The List" E.E. Austin & Son was rated in the top 10 on the Top Contractors List for 2012. This list was based on gross Western New York billings, company billings and number of employees. Two notable E.E. Austin projects are WCA Hospital Emergency Department and Olean General Hospital Outpatient Surgery Center. To view article, click here. Southern Tier Builders Association, March 2013 JAMESTOWN – Clemont "Cle" Austin of E. E. Austin Son was recently presented the Southern Tier Builders Association's "2013 Circle of Excellence Award". The award was presented by Stan Martinelli, President of the Association. The award is given out each year for outstanding contributions to the construction industry. To view article, click here. Risks, Reinvention, Drive: A Century of Success Behind E.E. Austin and Son, Inc. Manufacturer & Business Association Business Magazine, February 2013 The Business Magazine’s “Risking It All” section highlights the entrepreneurs who made sacrifices to build their businesses in our region. This month, we sat down with Clemont Austin, president of E.E. Austin & Son, Inc., with offices in Erie, Pennsylvania, and Falconer, New York, to talk about the rewards of owning your own business — and the risks you take to keep your company relevant. To view article, click here. Erie Times News, 2012 Cle Austin, President of E. E. Austin & Son is presented the 2012 Excel Award by Erie County Executive Barry Grossman. To view article, click here. Austin ServAll Concrete was recognized by the National Ready Mixed Concrete Association (NRMCA) in their June 10, 2013 e-newsletter as part of their centennial celebration of ready mixed concrete in the U.S. The recognition was echoed in the Pennsylvanial Aggregates and Concrete Association (PACA) in their weekly email. Austin ServAll Concrete is a member of both PACA and NRMCA. To view article, click here.